Movie: "Ghost in the Shell"
A cyborg cop searches for a hacker on a murdering spree, while simultaneously trying to unravel the mystery of her own past. "Ghost in the Shell" is directed by Rupert Sanders, who has previously only directed "Snow White and the Huntsman." The film is based on the manga of the same name, which was previously adapted into the popular anime by Mamoru Oshii. It stars Scarlett Johansson as Major Mira Killian, who is a cyborg with a completely robotic body and a human brain. She is said to be the refugee and the lone survivor of a terrorist attack...well, at least her brain was the survivor. She is assigned to the anti-terrorist task force known as Section 9. 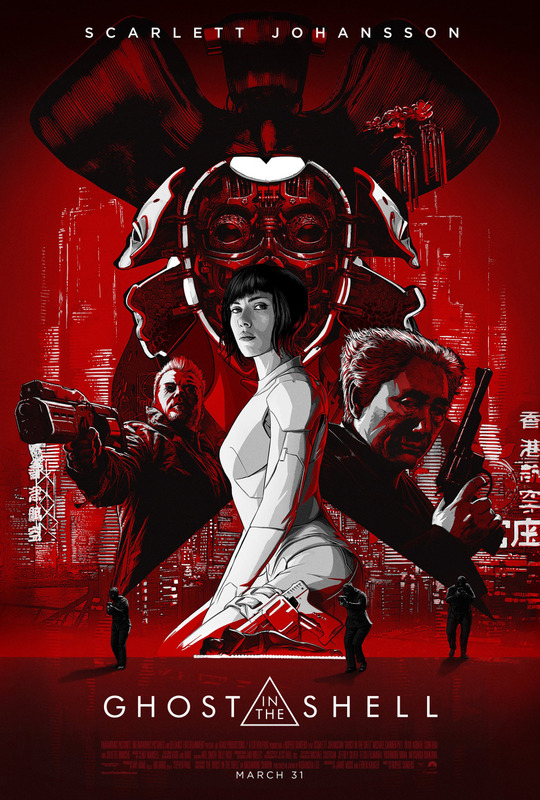 She is joined by Pilou Asbæk, who plays her partner Batou, as well as Juliette Binoche as Dr. Ouelet, Takeshi Kitano as Aramaki, Chin Han as Han, Danusia Samal as Ladriya, Lasarus Ratuere as Ishikawa, and Michael Pitt as the terrorist known as Kuze. Leading up to the movie, BigJ was looking forward to this live action adaptation of "Ghost in the Shell" quite a bit. Me? I approached it with cautious optimism. We aren't die-hard fans of the anime, but we really did enjoy it when we watched it a few weeks ago. We had also never read the manga, but were independently excited about this because we thought it could lend itself to a well made live action medium, especially with all of the technological advancements that have happened since 1995's version. As long as those involved in this project retain the same spirit as the original, it shouldn't be a problem, right? There was an opportunity to do something great and create a visually striking film that is both fun and smart. Unfortunately, director Rupert Sanders has created some intense and pleasing virtual eye-candy, but forgot literally everything else. Let's get the good part out of the way first. This film is gorgeous, and it should be with a $110 million budget at its disposal. It has stunning special effects, as well as some fantastic looking make-up work. There are many cool pieces to its visual puzzle, including the configured city where the movie takes place, the moving billboards that are endlessly draped around the city, and many of the costumes worn by both the protagonists and antagonists. This is where the positives end for us. Flash, dear readers, does not a movie make, and this film is all flash. However, the substance, the story, is not deep or insightful in anyway. It is a very thin tale about a cyborg cop trying to discover who she really is as she has these phantom memories she can't explain. So basically, it's a polished up, dumbed down version of "Robocop" with a stripped down version of the "Ghost in the Shell" anime. Everything that made the source material so smart and so ahead of its time has been all but removed, and in its place, a boring, cliche-riddled, overly dramatic sci-fi flop. The dialogue in this movie is terrible. Half of the time, it feels like the actors are struggling to keep a straight face while delivering their ridiculous lines, spouting off dialogue like "SHE'S BEEN HACKED!!!" with so much overemphasis, our eyes hurt from rolling them so hard. On top of this, so much of the acting feels phoned in and lacks any real passion. This is clearly a paycheck movie for everyone involved. Scarlett Johansson doesn't fit the role of the Major athletically or emotionally, though some may just be happy to see her in a skin-tight body suit. Her performance is too clunky, and not in a good, cyborg type of way, and she sticks out like a sore thumb in a project never meant for her. There is another actress who feels even more out of place and less happy to be involved in this project than Johansson, and that is Juliette Binoche. No one fits their parts at all, except for Pilou Asbæk, who isn't given much to do despite his clear physical similarities to the Batou character from the source material. Even if the actors were trying their damnedest, it wouldn't have mattered much. The narrative is so poorly constructed that it left us unchallenged, bored, and honestly, sleepy. On top of this, the pacing is atrocious. There are so many moments that are flat out dull, which is the biggest offense and sin a movie can make. It feels nearly three hours long, but isn't even two hours in length. We found ourselves massively disappointed with "Ghost in the Shell." Even with its glorious aesthetics, its poor pacing, goofy and stagnant dialogue, poorly fitting actors, and uninspired performances makes this version not only a letdown, but a movie we honestly hope to see crash and burn as we would all be better off if it were simply forgotten. It is mind-boggling how a one-time director like Rupert Sanders got this gig when in only one prior movie, he has shown he has little to no ability to make anything beyond a vapid bore. He has taken everything cerebral about the anime and has made is more palatable for the masses, essentially stripping the soul and spirit of such a compelling story away in exchange for this predictable, recreated mess. What a waste of money and time. 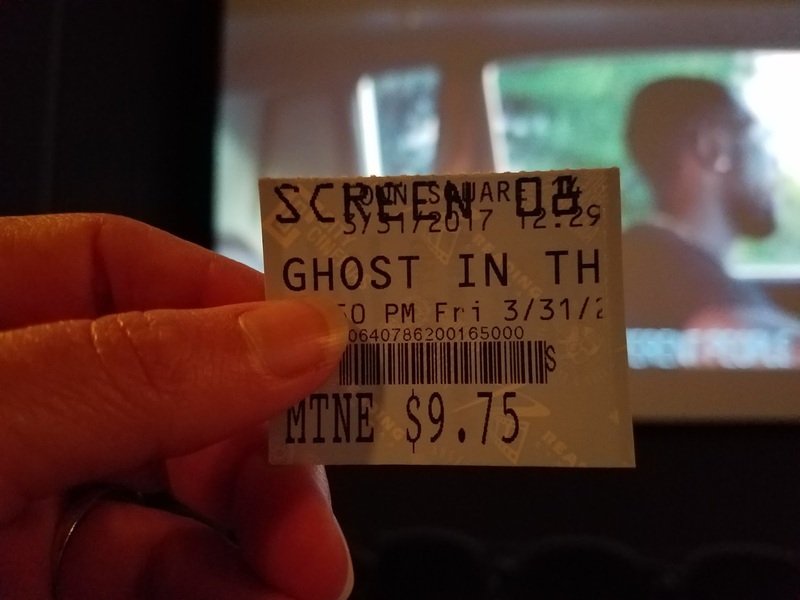 I agree that the movie wasn't good. I am curious as to why you think statements like "She's been hacked!" would be considered "bad" dialogue. I agree that the dialogue wasn't the best in this movie, but whenever I think of bad dialogue, I think of something that is either cheesy, cliche, or overly-expository, and a statement like "She's been hacked!" doesn't strike me as any of those. I guess my question is, what do you consider bad dialogue?